Domenica Vavala is a multi disciplinary artist practicing primarily in contemporary watercolour painting and drawing. Domenica’s practice explores themes of deep time through figuration, symbol and metaphor. Referencing nature mysteries, archaeology, and oral histories, her practice gravitates toward the notion of place and time. Caught somewhere between tradition and progression, belonging and displacement, there is a tension within her work which draws influences from her familial ancestry. Her work is a series of observations on the intersections between these and other things. Domenica holds a Bachelor in Fine Art (BA, Distinction) from RMIT University, Melbourne and a Diploma in Painting and Printmaking from NMIT. In 2016 Domenica curated and exhibited in a major group exhibition; MODERN MYTH at Counihan Gallery. 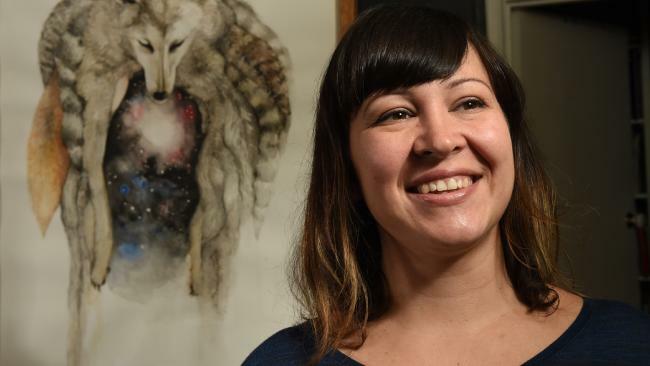 Recent exhibitions include solo show STRANGE MUSIC at Incinerator and finalist selections in the Mary and Lou Senini Award (McClelland Sculpture gallery), EMERGING ARTIST AWARD (45 Downstairs) and the SHE Exhibition (Walker St Gallery). Her artworks are held privately in collections throughout Australia and also in Tokyo, London and New York.